Mount Saint Elias is a huge pyramid shaped mountain with an elevation 18,008 feet. It is located on the Canada–United States border, 70 miles (110 km) northwest of Yakutat, Alaska. The first successful ascent to this mountain was made on July 31, 1897 by a party led by the duke of Abruzzi. Vitus Bering was the first European discoverer to sight this peak from his ship on July 16, 1741. It is the second highest peak in both Canada and the United States after Mount McKinley. Mount Saint Elias is the highest peak in the world which is so close to tidewater as it is just 35 miles away from the sea. Saint Elias National Park is the largest national park in the United States covering an area of 8,323,147 acres. This national park is also home to several volcanoes, including active volcanoes such as Mount Wrangell, and Mount Churchill. It is home to Mount Wrangell which is one of the largest active volcanoes in North America at 14,163 feet. Saint Elias mountain range has many peaks that exceed 17,000 feet including Mount Saint Elias, Mount Logan, Mount King and Mount Lucania. This mountain range produces the Malaspina, the largest single ice field in Alaska. This glacier flows out of the St. Elias Range between Icy and Yakutat bays in a mass larger than the state of Rhode Island. With Glacier Bay National Park, and the Kluane National Park Reserve and Tatshenshini-Alsek National Park, it is designated as a World Heritage Site. Mount Saint Elias is the ninth highest mountain peak in the United States. Declan, Tobin. " 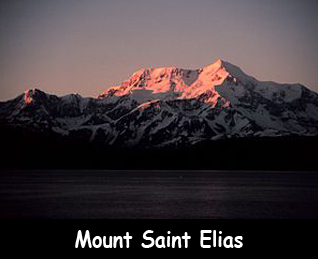 Mount Saint Elias Fun Facts for Kids ." Easy Science for Kids, Apr 2019. Web. 21 Apr 2019. < https://easyscienceforkids.com/mount-saint-elias/ >.